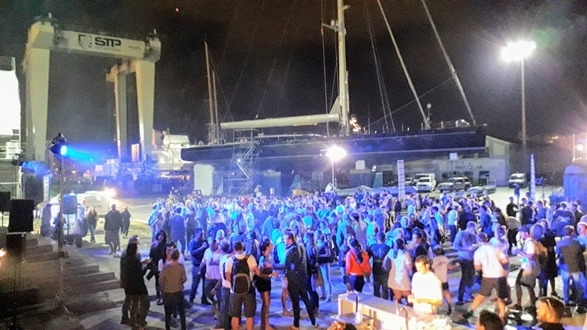 Coinciding with the beginning of season party, STP Shipyard Palma gave a turn to the barbecue for crews that offers every year and it was proposed to appeal to the solidarity of all the assistants with the aim of raising funds to help the victims of Sant Llorenç. With this goal, from 5 to 9 pm last Friday a barbecue was held for clients, friends, workers, and collaborators, animated by a fun group that sang versions of the 80's in the pin up style of the 50's and a DJ who used his original jeep as an improvised cabin. Encouraging the attendees to collaborate with this good cause, they went on sale tickets for drinks at a symbolic price, in addition to inviting everyone to add some extra contribution. The generosity of everyone made it possible for them to meet almost 3.500€ in less than four hours, which will be deposited in the official support account for Sant Llorenç to support those families who lost everything. José María Campuzano, CEO of IPM Group wants to “thank on behalf of STP Shipyard Palma, the solidarity, the interest and the degree of involvement of all attendees who turned to the cause without hesitation, and who approached the shipyard to make their contribution”. Both STP Shipyard Palma and the other companies belonging to the IPM Group carry out various charitable activities throughout the year, with the next one scheduled to cellect toys, clothing and food for Christmas, in which a high level of participation is expected. as it is obtained every year thanks to the generosity of its clients, industrialists, friends, employees and collaborators.